Historian Charles Austin Beard once said, “You need only reflect that one of the best ways to get yourself a reputation as a dangerous citizen these days is to go about repeating the very phrases which our founding fathers used in the great struggle for independence.” What do you think it says about America as a political society when the thoughts and beliefs of the man who authored our Declaration of Independence are shunned and ridiculed by a majority of the people? With increasing certainty I believe that, for the average person, patriotism means bowing down and licking the boots of the very people who deprive them of their freedom. For most people the idea of patriotism means faithfully paying your taxes; voting; and obeying the law. God forbid I ask that people learn what our Founders felt about something as insignificant as liberty or freedom from oppression. 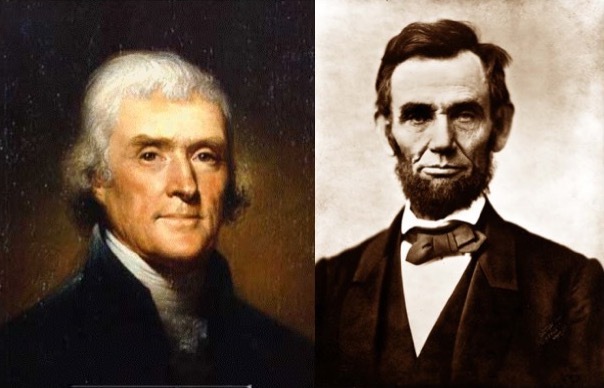 If you really want to know how pathetically we have lived up to Jefferson’s hopes and expectations all you have to do is look at how we shun his beliefs on a multitude of subjects, and how we idolize a president who corrupted the principles our country was founded upon…Abraham Lincoln. Thomas Jefferson was a staunch believer in State’s Rights; that the individual States not only had the right, they had the obligation to oppose laws passed by the federal government which overstepped its just authority and infringed upon the authority of the States. Say what you will about that but it sure sounds to me like Jefferson believed the States had the authority to tell the federal government to go to hell when they felt that the laws being passed violated the Constitution. I don’t think I need to explain how Abraham Lincoln felt about that belief; after all, he did raise an army and invade the sovereign territory of 11 States who chose to exercise their right to leave the Union. It really doesn’t matter whether the 11 States of the Confederacy chose to leave the Union over slavery or whether that choice was made because of the tariffs that had been imposed upon them; what matters is that it was their right to do so, and Abraham Lincoln denied them that right when he sent an army to force them into remaining in the Union. Jefferson felt that the States were not required to submit unquestioningly to the authority of the federal government. Lincoln believed that it was his duty to ensure that the States remain subject to the authority of the federal government; regardless of whether the government itself adhered to the document that created it. Jefferson believed in government by consent of the people; Lincoln, on the other hand, did not believe that consent was required; that the States could be forced into obedience without their consent. That is the fundamental difference between the two men, and one which is rarely mentioned in history books or political debates. Then of course there is the small fact that Lincoln actively sought to limit the liberty our system of government was supposedly established to secure. Lincoln suspended habeas corpus and imprisoned many who opposed his unconstitutional war against the South; he violated the 1st Amendment when he shut down newspapers who printed editorials critical of his policies; he sent troops into Maryland in an effort to block the Maryland State Legislature from voting on the issue of secession; and he even issued an arrest warrant for the Chief Justice of the Supreme Court; although he rescinded it before it was executed. There is not a doubt in my mind that had Thomas Jefferson been alive in 1860 he would have been on the side of the Confederate States of America. It may have saddened him to be on the side of those leaving the Union he had fought so hard for, but I think the abandonment of the principles our country was originally founded upon would have saddened him even more than leaving the Union. The Confederacy felt that the government, as it existed in 1860, was unconstitutional and therefore destructive of the ends for which it was established. They sought a peaceful separation from that government; and just like jolly old King George, their government sent armies against them to coerce them into obedience. Whatever your thoughts and feelings are about the Civil War may be, if you are honest with yourself you will have to admit that it forever ended the belief that we have a government that exists by consent of the people. I do not consent to it and yet I am forced to obey all manner of laws that violate my rights and liberty…or face the possibility of fines, jail time, or death if I disobey them. And that is the true legacy of Abraham Lincoln; the subversion of government by consent to government by duress. It all began in the Constitutional Convention when some felt, including James Madison, felt that the States should be mere appendages; that they should only be subordinately useful to the federal authority. It reached its realization when Lincoln ended the belief that the States had any authority to limit the federal government, or question its authority. Even his praised Gettysburg Address makes no mention of government by consent of the States; rather it states, “…government of the people, by the people, and for the people…” Well people are stupid, they are gullible, and for the most part they prefer comfort and security over the animating contest for liberty. People call me radical and dangerous because I come across sounding like I want to overturn the government. That couldn’t be further from the truth. I only want government to limit itself to the purposes for which it was established and leave me free to pursue happiness however I choose. But, as long as it does not serve that purpose, as long as it does not secure to me the liberty that is my birthright, I will oppose your government no matter which tyrant sits at the throne.